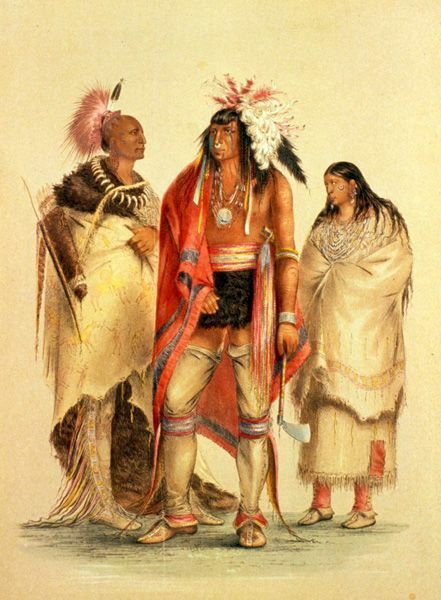 Trade was an integral part of the lives of many American Indian tribes well before the opening of the Santa Fe Trail. There is a significant body of evidence indicating that since prehistoric times, communication, travel, and trade had connected the American Plains with both the Southwest and prairies to the east. Southwestern aboriginal ceramics have been recovered from sites on the Plains, while prehistoric cultural material from Plains cultures has been recovered from the southwest, such as Pecos. Puebloan architectural influence is visible on at least one Plains site, namely El Cuartelejo in Scott County in western Kansas. Tribal oral traditions and early historical accounts refer to contact and trade between southwestern horticulturalists and Plains hunters, including the exchange of corn for bison meat. Plains tribes also traded with cultures to the east, such as Mississippian peoples in the St. Louis vicinity, and stone tools from Missouri are frequently recovered in archeological sites in Kansas. Trade fairs, hosted in Pecos, San Juan, and Taos, New Mexico were common in the late 17th and into much of the 18th centuries. 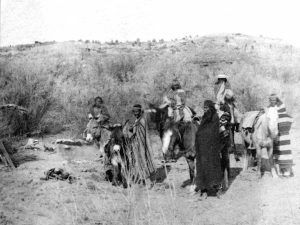 Large numbers of Pueblo and Plains Indians, including the Apache, Comanche, Kiowa, and Ute, gathered at these annual fairs to exchange stone tools, food stuffs, Native products, horses, slaves, and captured Spanish goods. These trade fairs were hosted in the summer months and witnessed the gathering – under temporary truces – of Indian tribes that often were in conflict with each other. These fairs also brought Spanish residents of New Mexico to trade with the American Indians. The Spanish, and eventually other European traders, introduced new items such as plants, animals, food, and manufactured goods that effected extraordinary changes among plains peoples. These changes were welcomed by the American Indians as the new items made traditional tasks more easily accomplished. A metal scraper allowed a woman to process an animal hide more quickly. Muslin or bed ticking made a durable and lightweight inner lining for a traditional tipi. An iron vessel, unlike the ceramic ones used for centuries, was virtually indestructible, and so it eased the ancient jobs of cooking and pot making. Further, the introduction of horses significantly altered the way the Comanche empire extended its reach by allowing more effective and efficient means of hunting, transporting, and warfaring. By the end of the 18th century, the trade fairs were less important to the American Indian economy due to large amounts of goods given by the Spanish to the Comanche and allied nations. The approach to trade was fundamentally different to American Indian nations and to the Spanish. For American Indians, trade was more than a way to gather wealth; it firstly created and solidified attachments between the trading parties that were meant to protect their respective tribal members from any and all harm; trade made all parties kin. In contrast, the Spanish (and later Euro-Americans) were influenced by the desire to acquire wealth and thus separated personal relationships with the trading partner from the economic benefits of the trade agreement. This fundamental ideological contrast between the American Indians and the traders later led to real conflict between the two groups during the course of the Santa Fe trade. By about 1700, most of the Indian tribes that would become familiar to travelers on the Santa Fe Trail were becoming established in the locations where American explorers would find them. 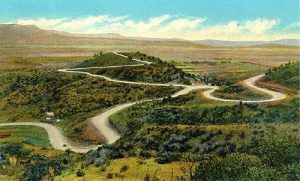 During the century leading up to 1800, what would become the Mountain Route of the Santa Fe Trail, was a path that was used by fugitive Puebloan people to escape from oppressive Spanish rule. Near the east end of the trail, Missouri and Osage tribes were in what became the State of Missouri. Kanza and Pawnee tribes were just to their west in modern northern Kansas. The Wichita were located in southern Kansas into northern Oklahoma, and the Kiowa and Comanche lands were in the short grass plains in the general vicinity where the states of Kansas, Oklahoma, Colorado, and New Mexico come together. Cheyenne and Arapaho were located on the west edge of the High Plains in western Kansas and western Oklahoma. The Plains Apache were in what is now northeastern New Mexico. North of Santa Fe in the Rockies, the Ute lived on the northern frontier of the Pueblos near the westernmost extent of the Mountain Route of the Santa Fe Trail. Before 1821, many people had followed the route to Santa Fe, or portions of it, from the American Indian inhabitants of the region to the many Spanish, French, and American explorers. Early Spanish explorers in the New Mexico Pueblo area recorded tales of the riches of Cibola and Quivira and encountered Natives of these places residing in the pueblos. Spanish explorer Francisco Vasquez de Coronado organized an expedition to the Plains in 1541 with Fray Juan de Padilla. Pedro Castaneda’s journals that he kept during the expedition indicate that they initially traversed a route to the Plains that went far south of the future Santa Fe Trail into the Texas panhandle before turning northward. They reached the Arkansas River near modern Ford, Kansas. Once across the river, the expedition generally followed the river northeast, as did the later Santa Fe Trail, to the vicinity of modern Great Bend, Kansas. 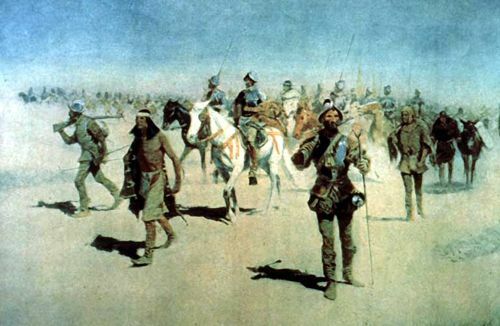 The Spaniards reached their goal of Quivira at some villages in the vicinity of modern Lyons, Kansas inhabited by ancestors of the Wichita and affiliated tribes. On the return from Quivira in 1542, their route closely resembled the Cimarron Route of the Santa Fe Trail from central Kansas to Santa Fe. Spanish residents of New Spain did not officially establish La Villa Real de Santa Fe (The Royal Town of the Holy Faith) until 1609 or early 1610. While the rocky, mountainous terrain encountered on the Mountain Route hindered access to Santa Fe from the north, several routes across the mountains existed. Among these routes were Raton Pass, San Francisco Pass, Manco Burro Pass, Trinchera Pass, and Emery Gap, with recorded use of these routes dating back to the early 18th century. During the summer months of 1706, Spanish Sergeant-Major Juan de Ulibarri followed a route similar to the Mountain Route of the Santa Fe Trail through Raton Pass to El Cuartelejo in western Kansas. Ulibarri sought to return a group from Picuris Pueblo who had fled to El Cuartelejo following the Pueblo Revolt of 1680. The Comanche discovered a better route across the mountains from west to east in the 1720s. Between the 1730s and 1763, reports exist of French traders from the Mississippi Valley supplying Comanche with arms and perhaps journeying as far as Taos, New Mexico. During the last half of the 18th century, Spaniards seemed to use the Sangre de Cristo route into the Arkansas Valley to the exclusion of all others. Pedro de Villasur, with an expedition of about 45 officers and soldiers, 60 Indian allies, a French interpreter, and one priest, left Santa Fe on June 16, 1720 under orders to investigate reports that the French, with whom the Spanish had been at war since 1718, were living among the Pawnee on the Platte River in Nebraska and intruding into Spain’s territory. The expedition traveled from Santa Fe to Taos, then north and east as far as Nebraska. 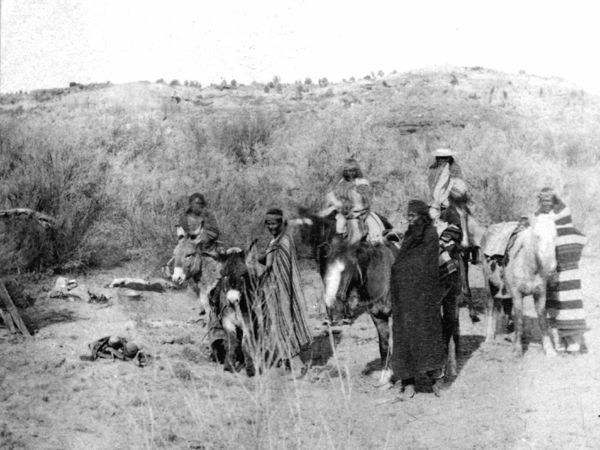 En route, the expedition stopped at El Cuartelejo where a group of Apache joined them to act as guides. Villasur’s route through Colorado and New Mexico may have followed one similar to the Mountain Route of the Santa Fe Trail. Pawnee warriors attacked Villasur’s expedition, killing all but a dozen of the Spaniards. The Spanish blamed the attack on French influence over the Pawnee. Although the Spanish continued to be wary of incursions by the French into their territory, some trade with Santa Fe may have occurred during the 1700s by the French on the Mississippi River through Indian intermediaries. 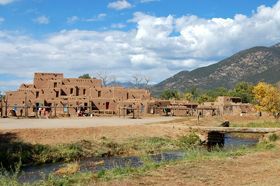 A number of French explorers and traders, including Jean-Baptiste Benard LaHarpe in 1719 and Etienne de Veniard de Bourgmont in 1724, attempted to open trade with Plains tribes and in Santa Fe with varying results. After leaving France, with his eyes set on the Santa Fe trade, LaHarpe was employed as a concessionaire in the Province of Louisiana before putting together his own expedition. Bourgmont traded with the Missouri, Kanza, and other tribes along the Missouri and Kansas Rivers in the area that nearly a century later served as the starting points of the Santa Fe Trail. It appears that Bourgmont may have traveled as far as the vicinity of Council Grove or Lyons, Kansas on the later trail.